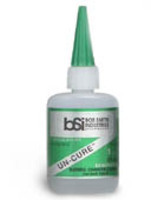 Shop online for 45 glues on sale at discounts up to 45%. Miscellaneous is the most popular of the 9 glues on sale categories, then Plastic Cement, and CA Super Glue Debonder. Pacer Glues is ranked #1 out of 15 glues on sale manufacturers, followed by Testors, and Hobbylinc. This is a Package of 5 Glue Tips from Testors. This is a 7/8oz Tube of Non-Toxic Cement for Plastic Models from Testors. For Ages 8 and Up. This is a 5/8 Oz. Tube of Non-Toxic Cement for Plastic Models from Testors. For Ages 8 and Up. This is a Package of 8 Model Master Precision Gluing Tips from Testors. Recommended for Ages 8 and Older. This is a 1/5 Oz. Bottle of Super Glue from Testors. For Ages 13 and Older. This is a 2 Oz. Bottle of Bondene Plastic Solvent Cement from Plastruct. This is the Pacer Technology 0.25oz bottle of Plasti-Zap Brush-On Medium CA.